Qigong Empowerment is the most unique and complete volume ever written in the English language on Qigong (Chi Kung). 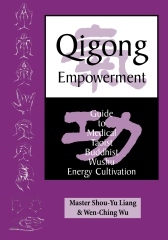 Click here to purchase your copy of Qigong Empowerment. ​Kung Fu Elements is one of the most comprehensive English language training manual Wushu Training and Martial Arts Applications. Click here to purchase your copy of Kung Fu Elements. Tai Chi Beginning is a complete workout reference manual for beginning Tai Chi students. Click here to purchase your copy of Tai Chi Beginning. Xiaoyoashuai is manual for the Wuji System Free Fighting Take Down Routine. Click here to purchase your copy of Xiaoyoashuai.